'Good Grief' -Tape 4-Self forgiveness and grief. Audio recording, originally produced in cassette format, dealing with issues of self-forgiveness and grief, produced as part of the Complicated Grief Programme, which was directed by Dr. Susan Delaney with Dr. M Katherine Shear as patron. 'Good grief'-Tape 3-Self compassion and grief. Audio recording, originally produced in cassette format, providing guidance for self compassion during grief, produced as part of the Complicated Grief Programme, which was directed by Dr. Susan Delaney with Dr. M Katherine Shear as patron. Audio recording, originally produced in cassette format, exploring the variety of emotions that grief can bring up, produced as part of the Complicated Grief Programme, which was directed by Dr. Susan Delaney with Dr. M Katherine Shear as patron. Draft programme for talk given by Dr. Katherine Shear on the Complicated Grief Programme. 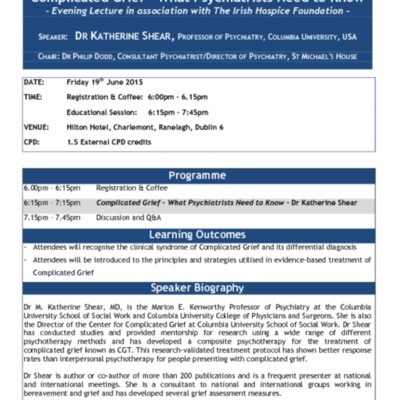 Draft programme for talk given by Dr. Katherine Shear, programme director, on the Complicated Grief Programme. Dr. Susan Delaney and Dr. M. Katherine Shear at Complicated Grief launch. 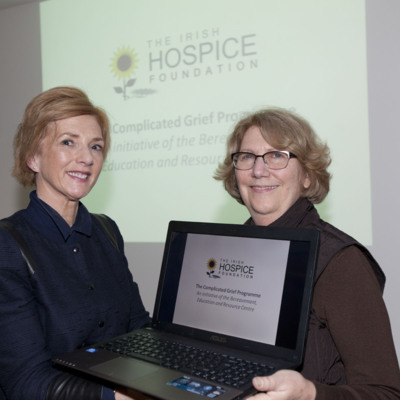 Images of Dr. Susan Delaney, Director, and Dr. M. Katherine Shear, Patron, at the launch of the Complicated Grief Programme in January 2014.